What Women Do Best, Multi-Tasking: SIPPING and CLEANING! Woke up with a headache and to a cold and quiet house, eerie. One teen is at a sleepover and the other, probably working, she’s turning into a workaholic like her mother; nothing wrong with a girl having ambition. I have been lying in this bed for two hours and it’s apparent the hormones are not aligned (feeling glooming). After scanning the twitter feed and Pinterest for hours, I finally got my tail up and making my own sunshine. 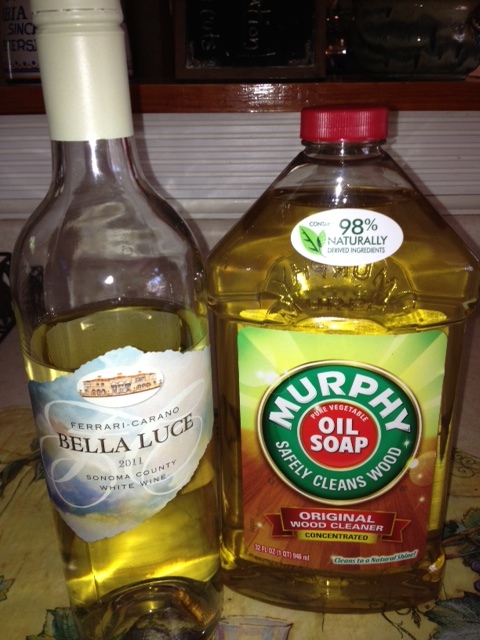 Blinds are open, radio on 92.5 (80’s – today classic/pop), Murphy Soap solution mixed and I’ve selected a white wine. It’s early, 12:23pm to be exact, so, I will start with a white then will finish the day with a red; yes, there will be more consumption later ;). The wine has been aerated, but lets open it up some more- SWIRLING – beautiful shimmering silver-lemon color. My mouth waters as I take a deep inhale of 2011 Ferrari-Carano Bella Luca. I’m greeted with a burst of pineapple, melons, honey and nutty aromas. The aromas are VIBRANT! Time to end this torture (mouth salivating), taste – WOW, BIG, FULL BODIED white wine! Delicious! Bella Luca has my palate in overdrive; fruity, pears, melons, and citrus flavors with a creamy slight oak finish. The fruit flavors remind me of a Pinot Grigio. I’m also picking up Sauvignon Blanc characteristics. The creamy and nutty finish is similar to a Chardonnay. Yes, I remember this magically delicious wine; a Saturday tasting at Winestyles, Montclair, VA. YUMMY! I can’t wait to read the back label. Back to the label, AH-HA! Bella Luce is a blend of Chardonnay, Sauvignon Blanc, Muscat Canelli and Gewürztraminer. WOWZER!!! Now, who’s behind the production of this delicious wine? Don and Rhonda Carano proprietors of Ferrari-Carano owns 19 vineyards in five different regions, which total 1,400 acres: Alexander Valley, Anderson Valley, Dry Creek Valley, Napa/Carneros and Russian River Valley. What I find unique is Ferrari-Carano Vineyards has a red wine winemaker and a white wine winemaker. The vineyard is located in Healdsburg, CA, 1.5 hours from San Francisco, CA in the Dry Creek Valley. If you’re interested in joining their wine club, wait in line, there’s a wait list, which is an indication, in my book, the wines are amazing! I have found my summer party wine and my friends are going to love it! Now, this is how you spend a Saturday afternoon, sipping and cleaning ;). Pairing: quote: “Refreshing as an aperitif, or with shellfish, light pasta dishes, and dreams of Italy.” I LOVE IT!